United States | Your Shelves! vintage art reference. The top right is my collection of rare sign-painter books. Signpainters were the original graphic designers. 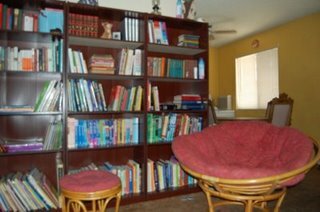 About the library: This is the library side of our home office/library. All of our books are on these shelves, with the exception of my husband’s psychology textbooks, my writing references, and our packed away children’s books. This collection is the culmination of my English major, his English minor, and our general bibliophilia. In addition to providing a home for our books, these shelves double as a jungle gym for our cats. I have to do some reshuffling/reorganizing, as evidenced by the empty shelf. About the library: This is about 10% of my books. I like to display nonbook items, such as an old radio, a fossil, and a bust of Mozart on the shelf with the books so that the bookshelves blend in with the room. My goal is to have a den with an old wooden desk placed in the center of the room surrounded by four walls lined floor to ceiling with books. About the library: I would probably have to take pictures of my entire apartment in order to show my entire library, but this picture shows my most number of bookshelves that are right next to each other.